Need a Home Inspection in Oregon? Experienced – knowledgeable – personable. 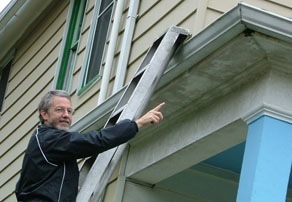 Call 503-752-9494 or e-mail jeff@housegeek.biz to schedule a home inspection or to ask questions. I also do specific, limited inspections, such as crawl spaces or roofs only, environmental health inspections, assessments for aging in place, or reinspection after work to correct problems identified in original home inspection. Fee: $250 per dwelling unit, plus $0.05 per square foot of floor space, plus $50 if the dwelling includes a crawl space, plus $2/mile 1-way travel distance from home office (1137 NE Beech St., Portland, OR). Report: Comprehensive home inspection report with photos of problem areas available within 24 hours of inspection; see Sample Report tab. Radon test (48 hours): $100 if included with home inspection. $100 plus $4/mile 1-way distance from office for radon test only. Additional charge if travel distance exceeds 20 miles. Results of test available within 2 hours of monitor pickup. "Jeff is the ideal home inspector -- professional, knowledeable, thorough, calm. I would recommend him to anyone needing a home inspection." "We were very happy with the inspections performed by Jeff. Getting an appointment was easy, the price was very reasonable and his suggestions proved invaluable in our re-financing. We highly recommend his service."